Start AX with a Bang at the Official Kick-Off Party on Pre-Show Night! Look. We know what you’re thinking. We wish Anime Expo happened twice a year, too! But that’s not gonna happen. And we’re sorry. So we’ve done the next thing best – made it longer! Join us on July 4 for Pre-Show Night, where you can be the first to experience this year’s Entertainment Hall, check out exclusive panels and screenings, sing your heart out in Karaoke, and more! Did we say more? Yes! We did! Thanks for noticing! 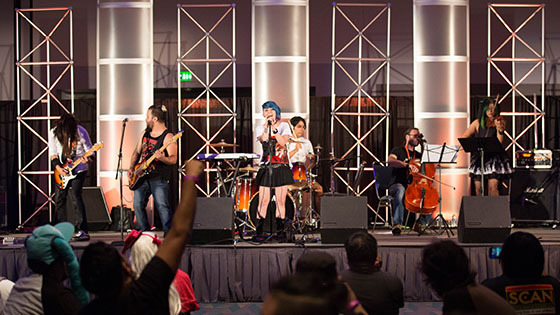 For those of you who are over 21, start your Anime Expo adventure at our 2018 Kick-Off Party in Lounge 21. Get a taste of some of the great events that this year’s AX has to offer, like an exclusive preview of our AXDance DJs and Fashion Show line up! Are you human, or are you dancer? You can be both with a sneak peek at our Maid, Butler, and Night Café acts! Do we like exclamation points? You bet we do! There’s just so much to be excited about! We need to order more exclamation points! How else are we going to describe the magic of AX?! Have a drink, take a seat, cut a rug, but don’t eat a bug (let the professionals handle that!) at Lounge 21 for the AX 2018 Kick-Off Party! The fun starts at 6:00 pm and doesn’t stop until 2:00 am! Come have fun! Because seriously. What else are you gonna do? Register for Pre-Show Night Today! All of Entertainment Hall featuring 10+ photo sets, eGaming, tabletop gaming, art show, Community Stage, and more! Starting this Friday, Nov. 24 at 12:01 AM, save 50% on Pre-Show Night badges until Monday, Nov. 27, plus get a Premier Fan badge or a discounted 4-day badge, while supplies last! Check out the full details to learn more about the Black Friday sale.